The coordinates are for the Wolfington Cemetery on CR 25S, west of West Baden Springs. Around 1820 two of the earliest quarries of Hindostan Whetstone came into operation near here. Whetstone is an evenly stratified siltstone of the Mansfield Formation which formed on silty coastal flats of an ancient sea. The distinct and minute layering of the stone is the result of fine sediments deposited by the daily cycle of tides which occurred around 300 million years ago during the Pennsylvanian Period (the geological time interval associated with Indiana's coal seams). Geologists call these layers "Tidal Rhythmites". These layers are so precisely recorded that, from careful measurements, they can even be used to determine the phase of the moon during the time the layers were deposited. This discovery is so significant that Indiana whetstone deposits are known internationally in the geological community. Beds of excellent quality whetstone were discovered near French Lick around 1810. By the early 1820s, Indiana whetstone was being hauled by wagons from quarries in Orange County, floated down Lost River to the White, Wabash, Ohio and Mississippi Rivers and on to New Orleans. Some Hoosier whetstone was even shipped overseas. Hindostan Whetstone is considered the earliest commercial enterprise in Indiana and by the end of the 1800s Indiana had become a world leader in production of whetstones. Probably the most important use of Hindostan Whetstone was for gravestones. Hindostan Whetstone gravestones are found across southern Indiana and into southeastern Illinois. Between 1820 and 1860 production of Indiana whetstone for gravestones may have exceeded that for sharpening stones. Gravestones made of Hindostan Whetstone are the oldest commercially produced gravestones found in Indiana, ranging from 150 to 180 years old. Despite their age, whetstone gravestones are so durable that the lettering and scroll work on many look as though they were carved recently. 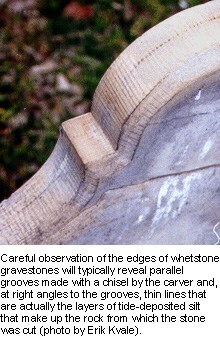 By measuring the width of the Tidal Rhythmites in a whetstone gravestone researchers can determine from which quarry the stone was removed. After the Civil War, with the expansion of rail transportation across the state, imported marble and locally quarried limestone quickly replaced whetstone gravestones. Whetstone headstones are characterized by three distinct physical qualities. First, they are generally more weather resistant than contemporary local sandstone. Second, the color of a whetstone monument, usually tan, but including off-white, buff, light brown and some partly rust streaked. Third, and most importantly, when viewed on-edge, these gravestone exhibits a sequence of relatively thick and thin layers running parallel to the flat faces of the stone (Tidal Rhythmites) that are characteristic of Hindostan Whetstone. Many of the gravestones also exhibit raised chisel grooves cut along the edge and sometimes on back of the stone. These chisel groves are at right angles to the flat faces of the stone and should not be confused with Tidal Rhythmites. 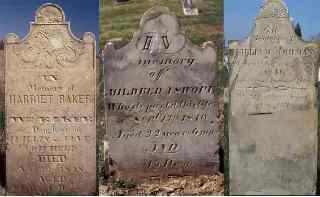 Click here for additional information on identifying Hindostan Whetstone gravestones. 1) Correctly identify a gravestone made of Hindostan Whetstone. This whetstone gravestone can be one at Wolfington Cemetery or one at a cemetery of your choice. (Whetstone gravestones can be found in many old cemeteries in southern Indiana.) Once you locate a suitable example, take a photo of the gravestone and post the photo with your Earthcache Log (Photos are not mandatory but are greatly appreciated). As an alternative to posting a photo, note the name(s) and dates engraved on the stone. Email Indotguy With the results of your Rhythmite count as well as the names and dates from the gravestone (If no photo is provided). DO NOT post this information with your log. I must be able to identify the marker as Hindostan Whetstone either visually or by location to confirm the find. Chisel grooves or tidal rhythmites?